Trocellen offers a wide range of acoustic insulation solutions for many different application fields, providing always a more comfortable environment. Our parquet underlay solutions should be laid using the “floating floor” technique and are ideal for the acoustic insulation of the drum sound. 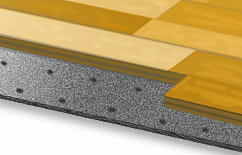 Chemically cross-linked PE foam laminated with embossed, scratch resistant metallic film (30 micron) with selvage.